We played our last concert of the 2016 summer season in Upper Denby at “The George” pub on 20th August. Despite the very British weather, we were undercover so it didn’t spoil our day; we had a lovely time as did everyone in the pub. Thanks for being such a fun audience, it really makes a difference. Now winter is creeping up on us and it is October already. Although we have no concerts this month, we have lots of work to do. We have been practicing some lovely pieces the last few weeks for our winter repertoire and very soon lots of Christmas favourites will also be added to our music folders. Shepley Band does have a small problem, however. We need more players. So please if you play any brass or woodwind or percussion instrument come along and have a listen and a talk to us. To start our recruitment campaign we are holding a “Bring a Friend Evening” on Tuesday 4th October at Shepley Methodist Church from 7.30pm to 9.30pm. Bring your instrument and have a play, meet the band and our new M.D. – David. Tea, coffee and biscuits will also be served. 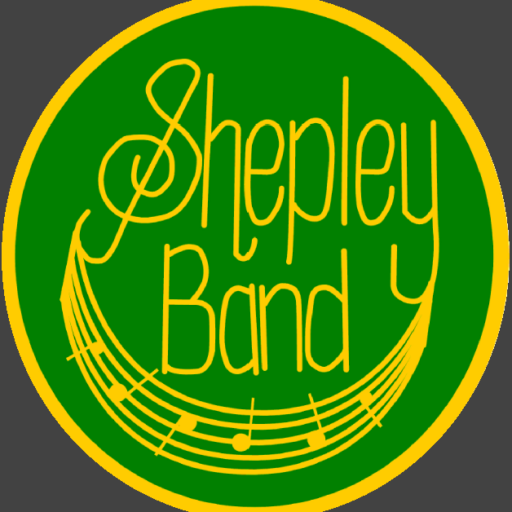 We are a friendly bunch and can’t wait to meet potential new Shepley Band members.